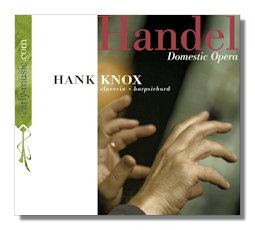 This CD goes by the title "Domestic Opera" and is a collection of harpsichord music adapted from Handel's operas. Recordings and radio of course being unavailable in the 1700s, those who wanted to hear Handel's theater music in their own homes sparked the demand for such transcriptions. Some of this music was arranged by Handel himself. The rest of it – on this CD, anyway – was adapted by Handel's short-lived contemporary William Babell. The latter was far from the only composer who made money in this way, although according to harpsichordist Knox, the quality of Babell's transcriptions was well above the era's norm. Babell also adapted the music of London's other imported operatic composers for his Suits. The second contains not only music by Handel, but also excerpts from operas by Polani and Gasparini. This is a great idea for a CD, particularly for those who wish that Handel had composed more solo music for the harpsichord. The present collection is not the first of its kind, though. On a Stradivarius CD released in 2002, Claudio Astronio presents a more complete selection of pieces from Babell's first and fourth Suits. One selection included on both Knox's and Astronio's CDs is Babell's ridiculously florid transcription (perhaps "fantasy" would be more accurate) of the aria "Vo far guerra" from Handel's opera Rinaldo. (Rinaldo also figures prominently in Babell's first Suit.) When Rinaldo was first performed in 1711 – it was Handel's first opera for the London stage – he conducted it from the harpsichord, and improvised instrumental interludes within that same bravura aria. Apparently Babell decided that he would go beyond even Handel, earning the displeasure of Charles Burney, who criticized Babell's showiness and striving after cheap effects. As if to rub it in, Burney refers to the composer as "Mr. Babel." (To disagree with Knox's booklet notes, however, I am not sure how Burney could have heard Babell play, as Babell died in 1725, or even earlier, and Burney was born the following year.) This excerpt, which brings both CDs to a close, just might be the most literally baroque work for harpsichord you ever will hear, second perhaps only to Antonio Soler's damned Fandango.